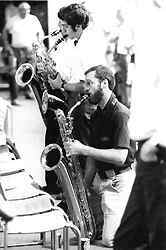 The London Saxophone Quartet had been friends of mine since the very early 1970s. We had discussed making a record on an eventually stillborn idea for a left-field classical label, Tadpole Records, about which Meirion Bowen, Nick Wright and I had been scheming before the oil crisis stopped us short by provoking a vinyl shortage. 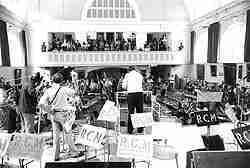 In 1976 the Quartet was the host and organizer of the World Saxophone Congress, held at the Royal College of Music in London. One typical idea that had been formulated several pints into one very pleasant London pub evening was that they might commission a piece for the unique sound that 120 delegates might make with instruments varying in register from contrabass to soprano. That went the way of all used beer. Six months later, I found myself working in EMI’s A+R Department. Another evening staring down pints, we thought of arranging two chestnuts for these 120 high-level professionals: White Cliffs Of Dover and All The Things You Are. It seemed so crazy that it might work, as they say. Paul Harvey, the soprano saxophone player, set to work on the arrangements. 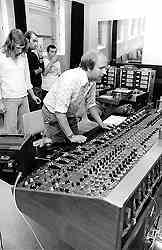 I sold the idea of a quick, cheap single to my boss, and provisionally booked Abbey Road’s remote recording unit with engineer Mike Sheady, one of their top classical engineers. Most of my effort went into the business manoevers. 120 players at recording scale rate would have been prohibitively expensive, so I cut a deal with the London Musicians’ Union (of which I was a member). The spirit of it was that if the delegates cared to record for the pure fun of it, no fee would be paid, but we would provide strong refreshment and a major, specified proportion of any profits would be paid into the Union’s benefit pool. The mobile unit was set up very early on that beautiful, warm, sunny morning, and everything electrical was checked before anyone arrived. Abbey Road were there at 8am, not a naturally musical time. I was close behind them, closely following a late gig the previous night. The concert hall featured two hours of presentations before our start time, during which the production crew sat around absorbing tea and coffee, occasionally checking that the microphones were still working. It felt to me as if we were waiting for the signal for some death-or-glory infantry invasion, but I had only heard about the Normandy beaches from my father. Just before 11am, Paul came in and said they were ready. I have never experienced such an adrenaline rush, before or since. Despite the early wake-up, my head was uncannily clear. I’ve tried to think of some convenient phrase to convey the sensation, but I can’t. I’ve never, ever thought as fast or efficiently (I think now . . . . . ). Paul’s introductory speech was eloquent and to the point – a less persuasive and enthusiastic person would have lost the whole house. Our wild rush set up the chairs and music stands, distributed paper and pens, and organized the players into sections depending on the register of their instrument. There was one contrabass saxophone, which took two people to carry into the room. The bass saxophone is a rarity (the lowest you see is usually the baritone). There were five of them. All was set within about 20 minutes. Paul raised his baton. I have never experienced the sound that was in the middle of all these loud instruments. It was colossally loud, but didn’t rattle the ears the way that a rock+roll group sound system does when it goes over the top. Nothing screamed. But my stomach shook, and the floor vibrated. This was a place to enjoy. But I had to run downstairs to check the sound. It was horrible. 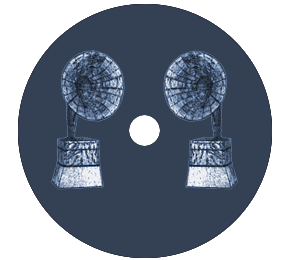 The sound was so loud in the room that no single player could hear the effect of the whole ensemble, so no-one could hear the overall pitch. 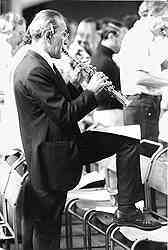 In an orchestral performance, the oboist sounds the concert A, then it is replayed around the various sections. Here, the mechanics were much less controllable. The saxophone can be broadly tuned, but its final pitch remains very dependent on the player’s lips, much more so than a flute or an oboe. Variation in pitch is inherent to the instrument’s expression. (Mechanically, it is very similar to the clarinet – recall the opening of George Gershwin’s Rhapsody In Blue and the extraordinary slide the instrument makes at the start.) I asked Mike to play me each section separately, then ran upstairs and walked round the hall asking each to sharpen up or flatten down. By walking around a couple of times and relying on memorizing the pitch in that part of the hall from those players, I managed to get everyone in a similar space. The clock continued, of course. Downstairs, it now sounded like a big ensemble. Curiously, it resembled a gigantic string section, but not one which could have been assembled for a practical recording. We finished the session with five minutes to spare, with two versions of each song but one superior performance which worked all the way through. There were two technical flaws, the sounds of beer cans being opened in a quiet bit, but they were ultimately either unnoticed or contributed to the general sense of party, depending on your attitude. The two songs were intended for a single and a follow up, but a sense of closure by the marketing department put them on the A and the B sides of the only single (yes, I did persuade them to issue the 7″ single record with a picture cover).The Marketing Department didn’t care much for the record, as I’ve mentioned and as you can tell by the misspelling of ‘saxophone’ on the cover. 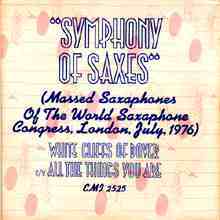 But Symphony of Saxes’ White Cliffs Of Dover was Record of the Week on Radio London. They didn’t expect that. Nor did I. Thank you, media.